WINSTON-SALEM, N.C. – Wake Forest University School of Business congratulates the 461 master’s and 272 bachelor’s degree recipients recognized during the Wake Forest University Commencement on May 21, 2018. School of Business master’s degree recipients were also honored at a hooding ceremony Sunday, May 20 in Wait Chapel. Holders of a master’s degree wear a symbolic hood draped around the neck and over the shoulders, displayed down the back with the lining exposed. The hood identifies the level of degree, the field of learning and the awarding institution. Three graduates received joint degrees as part of programs offered with other Wake Forest schools: two with the School of Law (JD/MBA) and one with the Graduate School of Arts and Sciences (Ph.D./MBA). Morgan Stanley Vice Chairman, Managing Director, and Senior Client Advisor Carla Harris gave the graduate hooding ceremony keynote address on Sunday. She noted that the graduates in attendance were joining the business world at a time when the economy is on its 10th year of an upward trajectory, the threat of inflation is seemingly low, and unemployment rates are at a ten year low. She said those indicators make leadership more critical than ever. A significant milestone occurred as the graduate students were invested with their hoods. Caroline Holt Dillon became the 1,000 graduate of the Masters in Management program. The School of Business established one of the first pre-experience masters in management programs in the United States in 2006. The entire hooding ceremony may be viewed on-demand at http://go.wfu.edu/wakeforestbiz2018. Students receiving class Leadership Awards for outstanding scholastic performance and integrity were: Emmaline Katherine Stilp (MA in Management); Emily Mary Haggerty (MS in Accountancy); Bruce Anthony Hunt (MS in Business Analytics); Cynthia Lynn Emory (Winston-Salem Evening MBA); Ricky Lee Otey (Charlotte Evening MBA); and Justin Tyler Plante (Charlotte Saturday MBA). Other honorees included: Junlin Huang and Jamila Isoke Diane Terrell, Impactful Pillar Award; Celine Vanderclock Olcott and Lauren Elizabeth Formica, Professional Pillar Award; Aubrey J. Wright, Honorable Pillar Award; Sarah Haruko Hayakawa, Global Pillar Award; Carly Marie Collette and Margaret Rene Collins, Outstanding Graduate Award – Assurance Services; Brendan Edward D’Amato, Outstanding Graduate Award – Financial Transaction Services; Emily Mary Haggerty, Outstanding Graduate Award – Tax Consulting; and Abriana Lesha Kimbrough and Elton Jonuzaj, Scarritt Family Pro Humanitate Award. Bachelor of Science degrees were awarded to 272 School of Business students with majors in Accountancy, Business and Enterprise Management, Finance and Mathematical Business during the Wake Forest University Commencement ceremony on May 21. Selected for undergraduate student awards were: Jiangyue Hu, Delmer P. Hylton Accountancy Award; Kevin Christopher Politz, the Academic Excellence in Mathematical Business Award; John Thomas Wolford, Spirit of Wayne Calloway Award; Constance Crosby Kapp, Lura Baker Paden Award; Tanner Kenneth Owen, Patel Prize in Finance, Yuewen Qian, the Academic Excellence in Finance Award, and Yunhao “William” Wang and Hayden Lewis Lineberger, the Citation for Excellence. 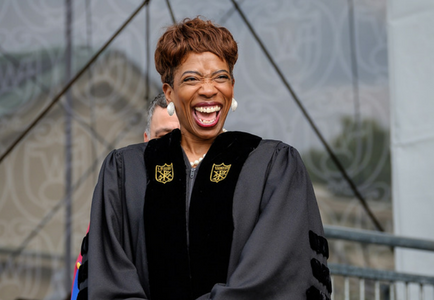 Harris received an honorary doctor of laws degree and was invested with the University’s hood on May 21, during Commencement exercises at Wake Forest University, where she also served as speaker.